Lost Highway tells the story of a special group of American artists: the musicians who create and perform country and blues music and those who mixed the two to create the explosive sound called rockabilly, which was virtually defined by Elvis Presley and Sun Records in the mid-fifties. These were the styles that transformed American popular music and transfigured its audience. Through biographical sketches, first-person narratives by the musicians, and a striking gallery of photographs, Guralnick has woven twenty-two extraordinary individual portraits of artists both celebrated and little known. From Elvis Presley to Sleepy LaBeef, Charlie Feathers to Charlie Rich, Waylon Jennings to Bobby 'Blue' Bland, Merle Haggard to Howlin' Wolf, Guralnick tells the story of how the working American musician lives, what it's like to be on the road day after day, playing nightly before one new audience after another, all on the chance of making it, cashing in, of achieving a success that all too often will be temporary, elusive, or even cruelly debilitating. 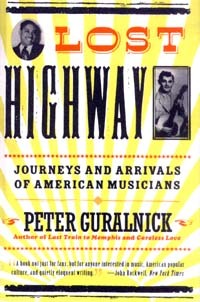 About the Author Peter Guralnick is the author of Feel Like Coming Home, a contemporary classic in the popular music field. He has written about music for Rolling Stone, The Village Voice, The New York Times Magazine, Country Music, Living Blues, and many other publications.